Adapted from the 2003 Governor General's Award-nominated book The Maestro. *Original compositions commissioned with the generous support of Canada Council. 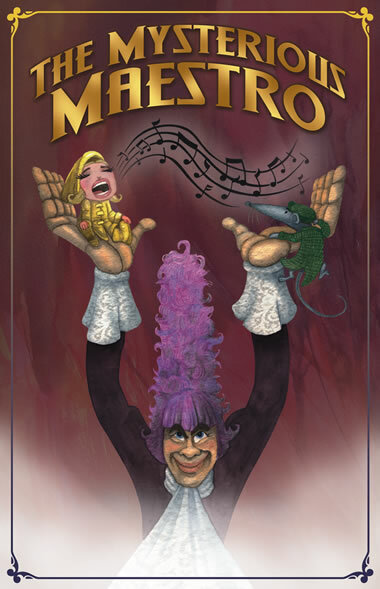 The Mysterious Maestro is a concert-story about a little girl who loves to sing… who moves to a town where music is forbidden! This town is famously named Hamelin -- thirty years after the infamous Pied Piper has led all of Hamelin’s children away. Hannah breaks the musical silence with the help of a gossipy rat and her own passion for grand music. 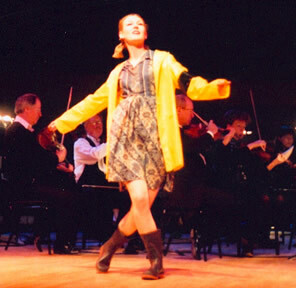 Eventually, she melts the heart of a desperate conductor and frees his imprisoned orchestra. Music is restored to Hamelin, and the orchestra regains its central part in the town’s new life. Fuelled by the music of Verdi, Mendelssohn, Liszt and Villa-Lobos, as well as original compositions by Canadians Dave Pierce and Donovan Seidle, The Mysterious Maestro races through dark nights and hidden caverns, and explores the nature of musical perfection… and obsession. This is a bewitching concert featuring great music and top-notch performances. Puppets and the Maestro's carved hands by The Old Trout Puppet Workshop. All selections listed below have been newly orchestrated for a 52(+) piece orchestra. Each part is bound in its own complete book. 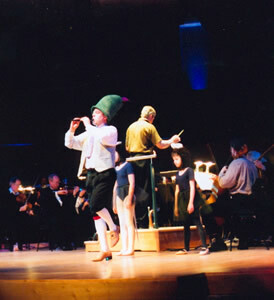 Ippolitov-Ivanov: Caucasian Sketches, "Procession of the Sardars"
** Original Canadian Composition Commissioned by Dandi Productions with support from the Canada Council. 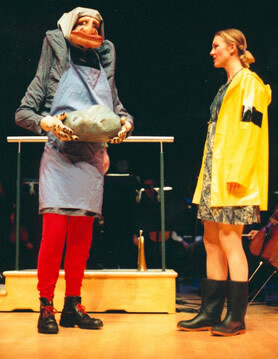 This production contains several technical elements, including lighting, amplified voices, choreography, puppetry, and interaction with the audience. Onstage, we require approximately 8-10 feet of playing area downstage of the orchestra, and a clear stage to both wings. In the Stage Right and Left Wings, quick change areas are necessary. 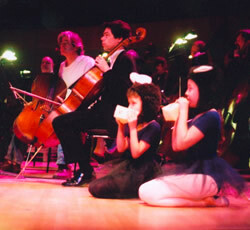 NOTE: The actors' voices will be amplified, so 3 wireless body mics (Lavs) must be provided by the orchestra or venue, along with a sound operator. They should be of the clip-on variety, not Madonna-style. The artists will provide mic belts. The conductor will require a monitor to hear the actors' voices. A simple lighting plan and cue list will be forwarded as necessary, consisting of downstage specials, a general blue wash, and a two colour wash on the orchestra. Lighting and sound operators are also required, and must be present at rehearsal. Dandi's tech liaison will be available the day before the performance and/or 1 1/2 hours preceding the rehearsal to meet with the stage crew/technicians and help with the techinical set up, as required. Sound is required at the rehearsal, as well as lighting elements. Discounts are available for additional Education shows or for booking additional education shows during the week when booking a weekend family concert. To book The Mysterious Maestro and to inquire about the music rental - please contact Dandi Productions Artistic Director Doug McKeag.